Cascara, once little more than a waste byproduct of coffee production, is now the drink de rigueur of the worldwide coffee scene. Cascara is the dried husk of the coffee cherry. East Africa coffee producers have steeped dried cherry for hundreds of years, but it’s been a recognizable export only recently—we first covered it in 2010. Depending on its quality, the prepared drink (steeped like tea) is a reddish amber color, fruity, and has a honey-like sweetness. Cascara has held the interest of new-wave specialty coffee companies for nearly a decade, and now it’s moving into the booze world in the form of a cascara liqueur. Before it was boozified, it was introduced to the United States in its purest form: served steeped alongside tea and coffee drinks at cafes like Stumptown Coffee Roasters, and sold wholesale by Durham roaster Counter Culture Coffee. In 2011, the Nordic Barista Cup worked with El Salvador producer and Sprudgie Award winner Aida Batlle to create a limited-edition cascara beer. Early cascara adopter Everyman Espresso experimented with the ingredient and created a syrup concentrate for cool refreshers like cascara soda. Square Mile Coffee Roasters used cascara as a substitute for cacao to create a chocolate-like bar for a coffee festival, and bottled cascara coolers are now available from Berlin to Grand Rapids to Phoenix. Sprudge used cascara kombucha as a punchline in a video, and years later it became a real beverage served at Scandinavian Embassy, alongside a raw oyster on a half shell with cascara infused butter. And now, Cascara Moonshine from Sydney’s Campos Coffee, the Sydney-based coffee roaster with locations in Melbourne, Brisbane, Sydney, and Park City, Utah. Campos created the “world’s first” cascara liqueur, with a limited 100 bottle run in December of last year. Sprudge was lucky enough to slip a bottle across international borders, and brother, it’s something special—we hope they make a couple hundred more bottles in 2017. I just had to learn more about this special spirit, so I reached out to Campos Head of Marketing Nathan James. Hey, Nathan! Cascara Moonshine. It’s real, and it’s spectacular. When did this new product debut? Campos Cåscara Moonshine first made its debut mid-December last year, with a first run of 100 bottles and was sold out within the space of one day. Who did you team up with to produce it? John Thompson from Campos Coffee and Andrew Fitzgerald from Melbourne Moonshine teamed up to produce the world’s first liqueur based on the Cåscara coffee cherry bean. They went through many trials and test batches of the product before settling on its current flavour profile. The challenge was to not let the moonshine overpower the sweet taste of the Cåscara. Where did you source the cascara? Cåscara is produced by the Helsar De Zarcero micro-mill in Costa Rica. Local farmer Ricardo Barrantes and his daughters have worked to create a unique process of de-pulping and drying organic coffee. 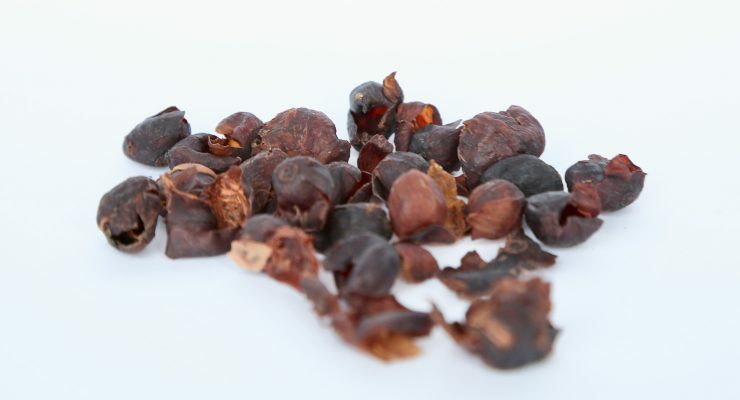 Unlike other cascara products on the market, the husks are dehydrated instead of sun dried. The result is a light, crispy shell, so crunchy you can eat as a snack. We knew we were onto a good thing once we’d tasted the liquor but were unsure of how the public would feel, as Cåscara is relatively unknown in Australia. But the response has been overwhelmingly positive, with customers loving the sweeter notes in the liquor, not dissimilar to cherry. It’s a really approachable flavour that people will have never tried before, surprisingly though it tastes nothing like coffee. A sell-out of 100 bottles in just a day demonstrates the positive response so far. Do you have a drink recipe you recommend? Shake over ice, strain into an iced tumbler and garnish with a slice of ruby grapefruit. For a better effect, infuse the Campari with coffee beans by adding 50g roasted coffee beans to a bottle of Campari, cover and refrigerate overnight, and strain and return to bottle. Can I pour it over ice cream? We firmly believe anything that can be poured over ice cream, should be. However this is especially true for Cåscara Moonshine, with a sweetness that would pair perfectly with a vanilla, white chocolate or coconut ice cream. We were thrilled to get to try this bottle. How can our readers do the same? Where does one buy this? The boys at Melbourne Moonshine are busy creating another limited edition Cascara Moonshine batch, so if you’re interested head to our website and place your name on the waiting list, and we’ll be sure to let you know when the next batch is released.